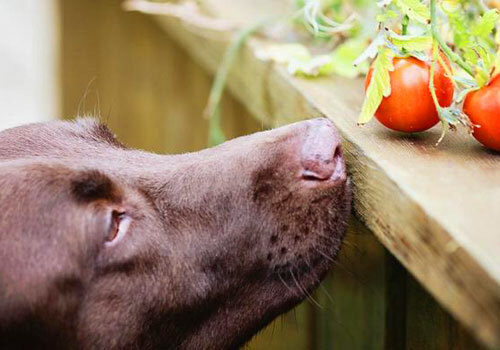 Can dogs eat tomatoes; this is one of the most common questions that many dog owners want to know because it is easily available in most households. Tomato is considered both a fruit and vegetable and it is an integral part of our daily food consumption and amazingly juicy too. And dogs are the kind of pets, who want to lure you into giving them food out of your plate almost every time you eat. That is the reason many people have been asking me, if they can give tomatoes to their dogs. The answer to this question is pretty obvious and I am sure you might have guessed… just like many other veggies, dogs can eat tomatoes. The only thing you need to worry about is the tomato plant, which contains a high amount of Tomatine (being a member of nightshade plants family with potatoes and many other veggies) as compared to tomato itself. Tomatine is toxic for dogs, the same way it is for humans. Although, tomatoes also contain tomatine, but the amount is very little, which is safe for consumption and not harmful to humans and animals. In fact, tomatoes have many healthy aspects, which favor in tomatoes consumption, but don’t let your pet to eat around tomato bushes only to result in diarrhea or bad digestion. Dogs and tomatoes are a controversial topic. The worst thing a little bit of ripe tomato is going to do to your dog is cause some stomach upset, nothing more. But you should not feed tomatoes to your dog in bulk; ingested in great enough volumes, naturally occurring chemicals from the vegetable can cause heart and nervous system problems. Let’s discuss this in details if tomatoes are really safe or not, and how often can dogs have tomatoes. Tomatoes contain many healthy substances, such as Lycopene; an important antioxidant which is known to work against cancer, oxidative stress and other diseases in humans and of course dogs as well. Research shows that tomatoes contain rich amounts of Vitamin A, C, B6 and B3, which can cover the lack of vitamins in other casual dog foods. Tomatoes also have a relatively high amount of potassium, manganese, fibers and phosphorus, making tomatoes one of the healthiest food in its category. Another health benefit of tomato is to dog’s bone health. Tomatoes give a fair strength to bone tissues. Research shows that, if the tomatoes are removed from a human’s diet for some weeks, it can be observed that the bone tissues of human body go weaker in just a few number of weeks. The same applies to dogs as well. Tomatoes play a significant role in fastening one’s metabolism in the case of humans. But it is a fifty-fifty fact for dogs, as there is no evidence or research proving it otherwise. This is to say that it is safe and healthy for your pet to eat a tomato now and then, but I will not recommend going overboard about it. If you are still worried about it, you can consult with your vet about the amount of tomatoes your pup can easily digest and it might not cause any fatal diseases. You might be passionate about your pets and love your dogs, but for the safety of its health, you need to keep your love and precaution separate. If your dog wants to eat many tomatoes or worse tomato plants, you ought to forbid it. 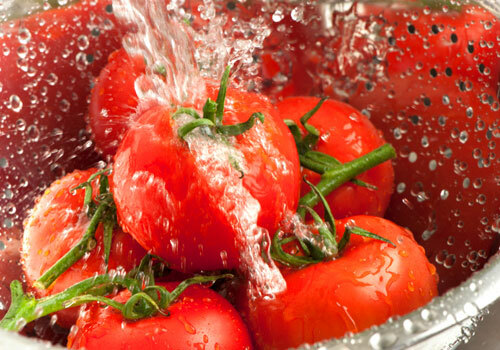 Tomatoes have two substances, which are considered very harmful if taken in large quantities. These two substances are Tomatine and Solanine, and these can cause toxic effects and other unhealthy symptoms in dogs. Basically, the tomato plant, the vine, leaves, and stems are the primary container of these substances, and tomatoes itself contain a very small traces of both. Tomatine is not properly digested by dogs, as their intestine does not absorb it very well, but in order to show some fatal illness, your dog would have to consume a lot of tomatoes in a short period of time. Tomatoes also contain a small portion of Atropine in its stems and leaves, which causes atropine poison if taken in large quantities. Effects of atropine include tremors and arrhythmias. There is also a downside of eating unripe tomatoes. Tomatine and Solanine are present in more quantity, in unripe and green tomatoes as compared to the ripe and red tomatoes. One just needs to be very careful while giving tomatoes to their pets, just like everything else. It is important to know about your dog’s health conditions first, before trying anything new in his diet. Tomatoes should not be given to dogs with arthritic conditions. Tomatoes make the arthritic problems even worse, as it meddles with the calcium consumption in such cases. 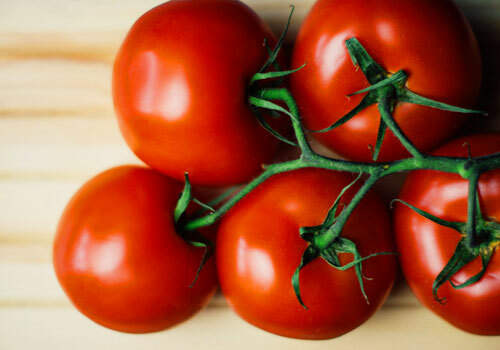 Consumption of tomatoes cause joint problems and worsens the situation. This is same in humans as well. Consider not giving your pet anything from the plant except for tomatoes. Avoid any tomato bushes when you go out for a walk with your pooch. And if you have a garden full of tomatoes, then don’t let your dog go out for a walk on its own or have a free access to tomato plant or a whole bunch of tomatoes. How to Prepare Tomatoes for Dogs? Super safe way to give a tomato treat to your dog, is to buy fresh red and ripe tomatoes from the local market, which contains the least amount of Tomatine. Why buy from the market, you may ask? Because by the time tomatoes are picked and transported to the markets and then sold, Tomatine amount will be decreased to its lowest level, as tomatoes continue to ripen. 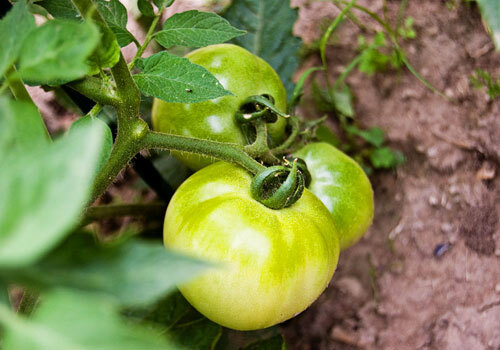 But if you have bought unripe or green tomatoes, then just wait until they have gotten enough time to ripe. I am sure, you don’t want your dog to develop health issues because of having some unripe tomatoes. Better safe than sorry… right! That’s why it’s critical for your dog’s health to give him best quality tomatoes. Although, you do not need to worry about the health contents and nutrition in tomatoes. You should also not worry about if the tomatoes were grown commercially or conventionally. Research shows that the nutrition and antioxidant levels in tomatoes are not affected by the way it is grown. Commercially grown tomatoes and conventionally grown tomatoes, show the same amount of nutrition, except for the Tomatine content, which decreases with time, as we discussed earlier. There are many health risk and uncertainties about this particular veggie that you might want to be careful about every aspect of this vegetable and the process of its consumption. To avoid any allergies, you can cook tomatoes a little bit, as cooked tomatoes are the best way to avoid intoxications without losing the health benefits of antioxidants and other vitamins present in tomatoes. One more important point, you should consider your pet’s size, weight and regular consumption of food, before deciding how much he should eat for a delicious tomato treat. To sum up the discussion, it is perfectly safe to give your dog this tasty treat but always in red as well as in moderation and not to mention, by your own hands. Your pet’s health and life depend entirely on you, so don’t let him treat all by itself, with the plant or leaves. If you see some side effects in your dog after a tomato treat, such as excessive sleep or shakiness or may be digestion problems, stop feeding tomatoes immediately. Although every dog is different and this can have different effects on different dogs. 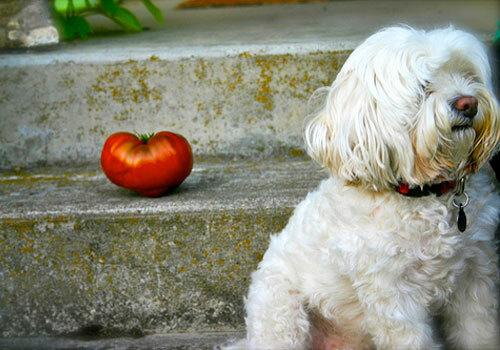 It is possible that your dog might not be able to digest even small amounts of tomatoes, while other can have plenty. So you need to monitor your dog’s health and behavior carefully because sometimes a small portion of a particular food can be toxic for your dog. My Dog Ate too Many Tomatoes! What to Do? In general, it is possible that the consumption of too many tomatoes might not do any harm to your dog, he might digest it all and jumps around happily. But there is a small chance that it might not be safe for the pet, and he might not be able to digest it properly. You need to be a good observant in that case. There are symptoms to watch in case your pet has eaten a lot of tomatoes and if that has caused indigestion or other problems. These symptoms can be worse in the event of consumption of tomato plants or stem. The symptoms for Tomatine toxication may include diarrhea, vomiting, upset stomach, constipation, weakness, excessive sleep, drooling, behavioral change, severe breathing and itching. If your dog shows some of these symptoms, then you should go to a vet for professional advice. He will be able to diagnose your pup properly and offer treatment if required. If you do not act on time, then it can be fatal to your dog, and it can intoxicate him to death, but don’t worry because there is a really very small chance of happening so. Here are some of the question that new dog owers frequently asks. 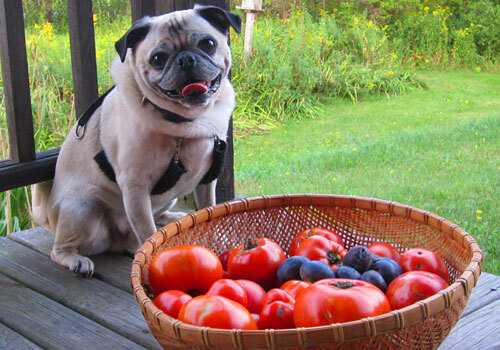 I hope we have cleared all your doubts and suspicions about tomatoes for dogs. 1. Can dogs eat tomatoes? Are tomatoes safe for dogs? Yes, an occasional treat will not hurt, but a large amount should be avoided. Tomatoes are considered safe, if given in moderation. Many people might not recommend tomatoes just to be completely safe and risk-free. But according to research, tomatoes (without tomato plants) are not harmful, if you feed your pet with precautions and according to tips from a vet. 2. 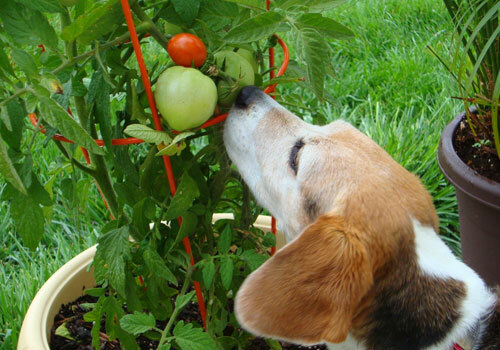 Can dogs eat tomato peels or plant? Tomato peels are healthy for dogs as these contain a large amount of antioxidant Lycopene, which helps prevent cancer cells. But don’t let your dog eat tomato plants including the vine, stem, and leaves, as these are not healthy for dogs because these contain plenty of toxic substances, such as Tomatine, Solanine, and Atropine, these can cause intoxication and other diseases as mentioned above. 3. Can dogs have green tomatoes? No, it is not recommended to give your pup a green tomato. Green and unripe tomatoes have a large amount of Tomatine and Solanine which can result in heart diseases, muscle dysfunction, indigestion problems and other health related issues. Always go for deep red and fully ripe tomatoes. 4. 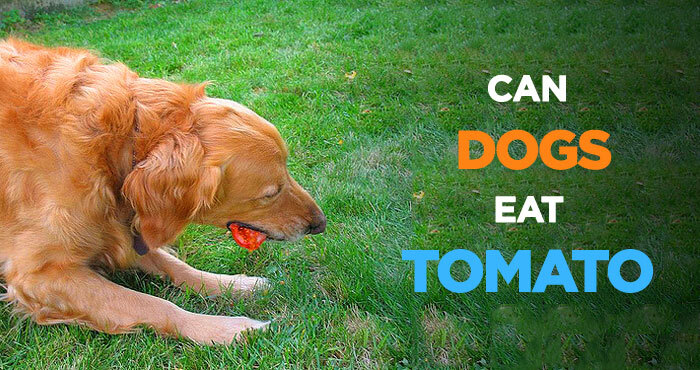 How many tomatoes can a dog eat? A small amount every now and then is harmless. Maybe one to three tomatoes can be considered enough, depending on your dog’s size, weight and the usual amount of diet. You don’t want to let a little puppy of 15 lbs. eat half a kilo of tomatoes. 5. 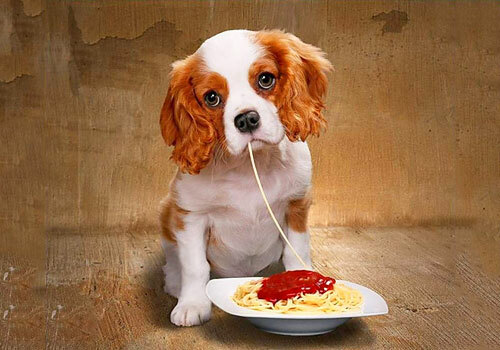 Can dogs eat tomato sauce? Tomato sauce usually contains onion and garlic which both are toxic for dogs. One should avoid tomato sauce containing other toxic foods, such as onions, garlic, etc. but these can have a little amount of sauce with only tomatoes and other non-toxic foods. It is not the tomatoes that are harmful but other food items in the sauce. 6. Can dogs eat tomato soup? Yes, as long as it does not contain any other toxic or dangerous food material for dogs. Make sure that your recipe does not include anything from the ‘forbidden for dogs’ list. You can sure give it some sips out of a simple tomato soup. 7. Can puppies eat tomatoes? 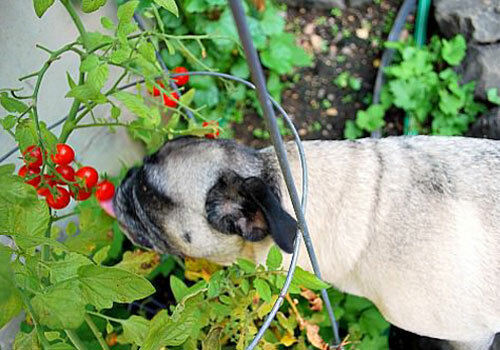 Yes, as I already mentioned, feeding practices for tomatoes is all the same for dogs and puppies. You can feed them in small pieces but make sure to give them ripen, red tomatoes without leaves and stems. And give them to an amount optimum for their health, size, weight and everything else. So the answer to can dogs eat tomatoes is, yes, dogs can eat tomatoes but give those small quantities of ripen tomatoes and keep the stems and plants out of the arena where your dog hangs out. A tomato garden is off limits. Keep it casual and don’t overdo it for the sake of your little buddy. Do not replace his regular diet with tomatoes or any other fruits & vegetables. Your dog still needs to eat high-quality dog food. Avoid large quantities and green tomatoes. And try to avoid other toxic food combined with tomatoes, as in salad, sauces and pizza which might have onions, garlic, avocados, etc. Be observant for the after effects of tomatoes to your dogs and go to your vet for immediate help if you notice something unusual. The best way is to ask your vet beforehand and then feed your pet some tomatoes or soups or anything else for that matter. It looks like she love playing hide-and-seek with you. Very cute.